Back in college when I dreamed of becoming a PCV, I met with a Peace Corps recruiter. She told me that my liberal arts degree only qualified for a community development position, which is a small percentage of Peace Corps Volunteer positions around the world. I wasn’t a competitive applicant. She recommended that I join City Year, a year-long service program through AmeriCorps. I did so, and became a competitive Peace Corps applicant because I then qualified for education and youth development positions. City Year targets 17-24-year-olds for a demanding year of service in underprivileged areas in major cities throughout the US. City Year corps members work on a team of 10-16 diverse young adults from around the country. In either an elementary, middle, or high school, corps members are assigned to one or a few classrooms to serve as tutors and mentors. Corps members follow those same kids throughout the year and take them out of class for one-on-one or small group tutoring. Outside of the classroom, corps members put on events for the school, paint murals and really do anything that adds to a positive school climate and falls under school beautification. City Year and the Peace Corps established a partnership not so long ago that encourages City Year alums to join the Peace Corps and vice versa. The Peace Corps loves City Year. City Year alums are given priority in a group of Peace Corps nominees. Score! City Year exposed me to so much diversity — at my school and within the organization. People I worked with came from all over the country and from different cultures and ethnic backgrounds. They taught me how to work with people different from myself, especially those that exercise different styles of leadership. City Year prepped me emotionally. It’s extremely hard to see the failures of public education and the rampant social issues that exist in our Peace Corps service communities, but it doesn’t eat me alive because I saw a lot during City Year. Kids in communities abroad face some similar challenges to those that live in City Year communities, just in a different setting and culture. City Year gave me the classroom experience I needed to make the next step to become a teacher in the Peace Corps. I basically got my feet wet and learned how to teach students who are far behind grade level and how to implement a supportive learning environment. 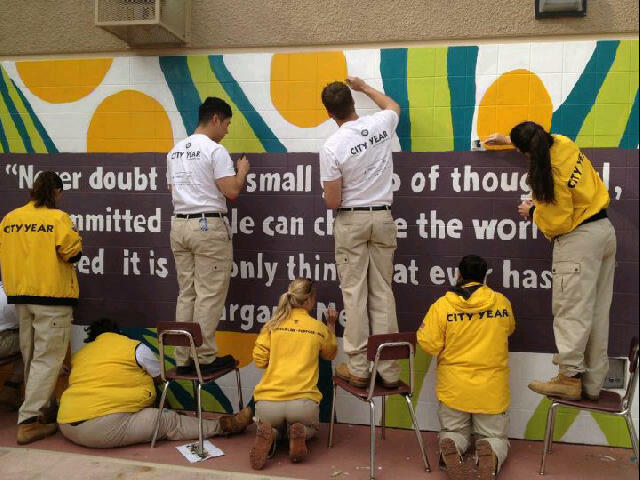 City Year taught me how “another world” within America operated. Although I was serving in America, I stepped outside of my comfort zone and experienced a culture and neighborhood opposite from my childhood. I gained cultural and social awareness. Now in the Peace Corps when anything frustrates me I am able to decipher problems or my frustrations by looking at the culture, politics and social issues intertwined. Such observation and critical thinking taught me to be resilient, a quality the Peace Corps looks for in its Volunteers. I am calm when working in my Peace Corps village because I can embrace differences and not look at issues from one point of view, but many. I would recommend this AmeriCorps program for any Peace Corps college hopefuls who either need more qualifications to be considered or think they need more experience before moving abroad. Not to mention, you’ll earn the Segal AmeriCorps Education Award to help pay off student loans.